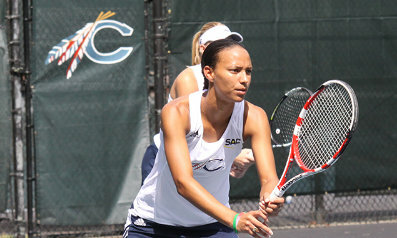 Kirsten Saltus and her Catawba Women’s Tennis teammates wrapped up their seasons with a non-conference 7 – 2 win over Shaw University. Playing in the number six Singles spot Saltus defeated Teodora Jovanovic in straight sets 6-1, 6-4. Saltus teamed up with Emily Corcoran in the number three Doubles position and they defeated Simbiat Aleem and Helena Fekete 8-3.